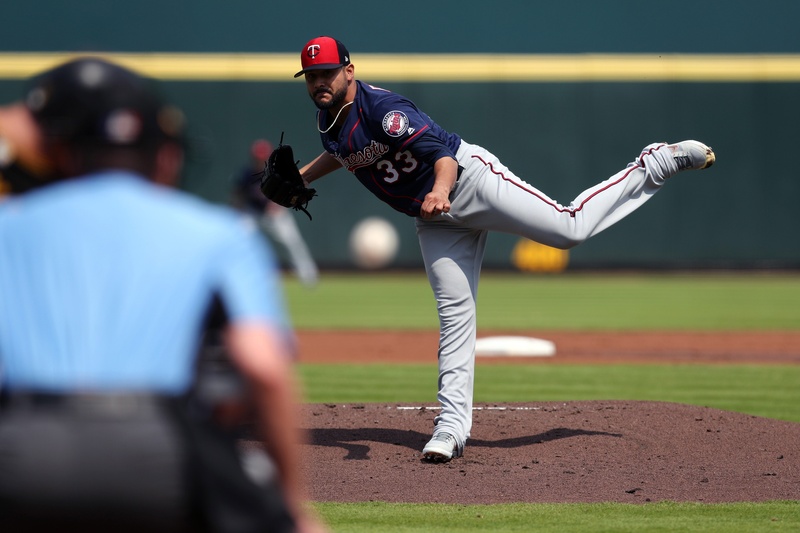 Ask any Twins pitcher what they are working on this spring and you will get a similar answer: Almost all of them are concentrating on driving off the rubber from their heel rather than their toe. As an example: After one outing Jose Berrios said that he was focused on driving from his full foot, feeling his weight sink into his heel before exploding toward home plate. Berrios, whose fastball averaged just under 94 mph in 2018, was flirting constantly with 95-96 during this particular spring start. All around the clubhouse there are pitchers saying the same thing as Berrios. Kyle Gibson. Jake Odorizzi. Martin Perez. Stephen Gonsalves. Chase De Jong. Everyone is turning heel. This is one of the immediate effects of hiring Wes Johnson as the new pitching coach. In some regard Johnson’s emphasis on getting into the heel feels like this year’s thing. When Neil Allen first arrived with the Twins as the new pitching coach in 2015, he spent all spring convincing pitchers they needed to throw more changeups. Twins pitchers talked about the importance of throwing changeups to same-sided hitters or throwing them back-to-back. More changeups was Allen’s thing. How did that work out? The team’s changeup usage rate rose a bit but the results didn’t follow suit. Through Allen’s tenure, the Twins held a 4.58 staff ERA, 26th out of the 30 clubs. Johnson’s message, however, is one that concerns a pitcher’s entire foundation. Embracing it can be career-changing. When you ask him to elaborate on what makes this seemingly minor portion of the entire delivery such a critical component, Wes Johnson’s face lights up and he goes into his full biomechanical spiel. It’s fairly basic. Pitchers who drive off of their toes first are not maximizing their velocity potential. Johnson admits that the concept isn’t for pitchers to actually drive off their heel, it’s to get them over the middle of their foot more. Cueing them to over-exaggerate and focus on the heel puts them in better position. When pitchers drive off their toes, they not only leave some MPHs on the table, they tend to have more inconsistent direction to home plate, wreaking havoc on their command as well. His reputation as a collegiate pitching coach is sterling and that was built on a velocity increase system he created. While with Dallas Baptist University, Johnson would take pitchers who were throwing in the upper 80s and have them reaching mid-90s within a couple of years. It happened again at Mississippi State and again at Arkansas. Johnson found that when more emphasis was placed on the lower half, velocity followed. Just like he did with his college athletes, when he was first hired by the Twins, Johnson said he spent days studying his pitchers to see who could use some adjustments. “I watched too much video. My wife is probably wondering what I was doing all offseason,” he says with a laugh. But the preparation from him and the rest of the Twins’ coaching staff allowed Johnson to have conversations with pitchers when they reported. Being able to function as the new pitching coach is a bit easier when one of the veteran leaders of the staff is a big proponent of Johnson’s practices. Gibson is very familiar with these principles. Before the 2017 season, Gibson spent time at the Florida Baseball Ranch, retooling his mechanics with owner Randy Sullivan. Johnson, who had spent years working with Sullivan and other baseball outsiders, had a hand in creating the Durathro system which Gibson used to overhaul his arm action. But it was changing his lower half movements that sparked something for the right-hander, notably using Johnson’s cue of driving off his heel versus his toe. Like Johnson, Gibson is an avid film-watcher. He says he can quickly spot the flaws in himself and others from shots on the center field camera. Gibson transformed his mechanics, engaging his lower half more, activating those “big muscles” in his legs. Gibson unlocked some additional heat but he also felt like he was able to locate all of his pitches better as he drove toward home plate compared to when he was stepping across his body. By the second half of 2017, when the new arm path and lower-half mechanics began to feel natural for Gibson, his career turned a corner. His body direction is what helped him against left-handed opponents in 2018. Previously he rarely went inside to lefties. From 2013 through 2016, he threw on the inner-third of the zone to left-handers just 30% of the time, opting to stay on the outer-third (49%). In 2018, no longer cutting himself off mechanically, Gibson attacked inside to lefties (48%) to great success. Johnson said coming into camp, he and assistant pitching coach Jeremy Hefner had spent endless hours creating individual plans for the entire staff at the major-league level. He knew that if he presented video evidence and data, players would respond favorably to the adjustments. Gibson’s success helped the conversation move forward with other players. He convinced Jake Odorizzi to visit the Florida Baseball Ranch this offseason. Kohl Stewart also made a visit. There’s also Martin Perez, who witnessed a spike in velocity at the end of 2018. Johnson said the message they gave Perez was to get in his heel more and move more athletically. His velocity has been consistently up at 95-97 all spring. In addition to established pitchers like Gibson and Perez, Johnson and Hefner want to infuse the concept to pitchers who are currently on the fringe, hoping to stick in the big leagues, such as Chase De Jong. The 25-year-old De Jong has 47 major-league innings to his name. A former second-round draft pick, De Jong’s career has stalled at the Triple-A level. He doesn’t possess the high velocity normally seen by modern pitchers – averaging sub-90 on his four-seamer – and he has walked a few too many hitters (19 batters in 47 innings). Still, De Jong represents an arm the Twins would like to maximize. Johnson agreed with De Jong’s assessment. Similar to what Gibson went through in 2017, De Jong recognizes that implementing a new feel into his mechanics isn’t something that will produce results overnight. After all, his first foray this spring was rough. De Jong will start the 2019 season in Rochester, hoping to lock in the new movement patterns and eventually contribute with the Twins this summer. He will be joined at the Twins’ top affiliate with Stephen Gonsalves, another pitcher trying to incorporate Johnson’s cues. Johnson uses Gonsalves as an example of how the process isn’t a straight line. In one outing this spring Gonsalves saw hit velocity tick upward. In the next, it went back down. And that is Johnson’s biggest point: It’s a process. There is no guarantee of immediate success with any of the pitchers. While Gibson may have been able to advance his career through these methods, it did take him a little over half a season to feel comfortable. Many of the pitchers attempting to incorporate the new biomechanics may not see the consistent results for another season or two. That being said, if Johnson’s collegiate track record is any indication, the Twins should see that velo clout soon enough. Great article. The new pitching coach seems good. Let's hope that we see it pay off over the season. Or maybe it's just a new gun. Very interesting and hopeful article. Lot's of info and good interviews. Thank you. Not sure if this is meant as snark or not but in my conversation with Wes, we did not discuss Romero at that time. Not sure if he received the full treatment or not. Some players, like Trevor May, were told they work well on their back foot already and were given other things to work on this spring. only question I have is whether the change in velo will also affect (postiviely or negatively) movement. We all know an ML hitter can hit a 100 MPH straight FB... Does this change affect things like when the pitch breaks and what not? When reading this article, I thought about two pitchers who throw across their body, whom might benefit from Johnson's teachings: Duffy and Reed. Watching pitchers throw across their bodies like that seem so foreign to me. It just does not seem right. Duffy has changed his way of pitching the last couple of years trying to find something that works for him to get back to the effectiveness we saw from him in his first year. I wonder how Johnson and Duffy are working on his delivery. He may well need more time to get comfortable with a bigger change in his delivery if he chooses to go that way. As far as Addison Reed, I can't help and wonder if throwing across his body for years has put strain on his body and caused him issues this past year. Not mean to be snarky, but since Romero seemed to be counted on as a big piece of the bullpen and he had a horrible spring training Ijust wanted to know if they worked with him or not.If not maybe they should have. The description Johnson gave of his heel-centric theory (along with Gibson's translation) reminded me of watching Nolan Ryan pitch. His velocity always appeared to me to come from the tremendous leg drive he had and not from his arm speed. He must have been a heel-centric pitcher long before biometrics became a known entity. The drive portion of the mechanics doesn't really effect movement of a pitch. That's more from the grip/release/angle. It can alter the location (as mentioned with Gibson). So like a guy like Reed who fires across his body may have his location shift a bit. House's big contribution to pitching (one of, anyways) is that he had Ryan land on the ball of his front foot instead of his heel. They did the same with Randy Johnson. First off, great article. But, if “everyone is turning heel” as you say, then that would include Romero. So some might be curious to know if Romero was struggling because of a new delivery, and if he was optioned down in order to get the feel back in his old one. Just some questions, and I admit that bringing up Romero’s struggles might be making a mountain out of a molehill, not to mention outside the scope of your story. But, if “everyone is turning heel” as you say, then that would include Romero. Just to clarify, what I wrote was "Almost all of them are concentrating on driving off the rubber from their heel rather than their toe." Again, Romero did not come up in the conversation with Wes. The pattern, to me, seems to be the guys who had low velos were pushed toward concentrating on the heel. Romero might not have that particular issue. It's possible that they are working on direction and some heel work. The other point I need to emphasize is that it's not an easy thing. Gibson talked about how it took him not only his 2017 spring training but also the majority of that season to get 100% comfortable with the new movements. It's possible he's working on it and just misfiring a bit. Bottom line is I don't know. It would be good to have a beat writer follow up on that. I like to tell 'em, "Hey, just throw it like Nolan Ryan." The guys that did that, increased their velocity significantly. Tom Seaver also stressed strong legs as the reason for his success. Great read, thank you for posting this. Wes Johnson is the kind of pitching coach we have been clamoring for.....well....my entire lifetime I think? And there was that one guy. Nolan something or other. He was pretty good too. I remember watching a Tom Seaver video when I was a kid trying to learn to pitch, and he emphasized "driving with your plant leg," to keep going "north-south," --which I think is another way of saying, "drive with your heel, to stay on line." If Ryan could have walked 800 less batters in his career he could have passed Spahn for victories. The only concern is the extra velocity seems to increase arm injuries. College coach will be in a different environment.